CLICK IMAGE FOR FULL EFFECT! 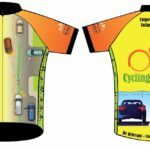 This is a one-of-a kind custom​​ jersey for cyclists who want to assert their right​s ​to ​drive their bicycle defensively ​(​by helping motorists avoid mistakes​)​ and educate other cyclists. Designed by Keri Caffrey, co-founder of CyclingSavvy, the back shows a cyclist controlling the travel lane with a motorist changing lanes to pass. The front illustrates how cyclist lane control provides sight lines that prevent or reduce the ​likelihood of the five most common motorist-caused car-bike crashes: dooring, sideswipe, right hook, left cross and drive-out. And “CyclingSavvy.org” indicates where online and in-person traffic cycling instruction can be found. This high-quality fitted jersey is based on Bontrager’s Specter jersey for men and Anara jersey for women. Profits after handling will be donated to the American Bicycling Education Association to support the development of CyclingSavvy traffic cycling educational programs.